Located approximately 1500 miles east of the Philippines, Guam was “sold” to the US by Spain as part of the 1898 Treaty of Paris which ended the Spanish American War. The treaty allowed for temporary control of Cuba and ceded “ownership” of Puerto Rico, Guam and the Philippine islands. Source. The transfer of power from one colonizer (the Spanish) to another (the US) did not reach the level of violence in the Philippies. The local Indigenous Peoples, the Chamoru, looked upon the new colonizers with uncertainty. Source. The US Supreme Court of McKinley’s day set about to formalize the “inferiority” of the colonized. The “Insular Cases” decision of 1901 actually declared residents of territories as not “created equal” but were rather “alien races” who “may not be able to understand Anglo-Saxon principles” or laws and justified the withholding of constitutional rights. It was decided that new territories might never be incorporated into the union and were to receive only unspecified ‘‘fundamental’’ Constitutional protections. They were to be governed without the consent of the governed in a system that lacked the checks and balances that underlie the principle of limited government. Source. Approximately 115 years later, this contemporary federal perspective on self-determination would again be made clear. Maria Lurie, Attorney-Advisor, Office of the Solicitor, DOI reiterated that this decision was still “good law” since it has never been overturned. As was the case with Hawaii, the US immediately moved to eradicate the Chamoru language so as to “civilize” them and ultimately decrease resistance in the long term. The navy rounded up books written in Chamoru and burnt them, which was reminiscent of book burnings in 1933 Germany. 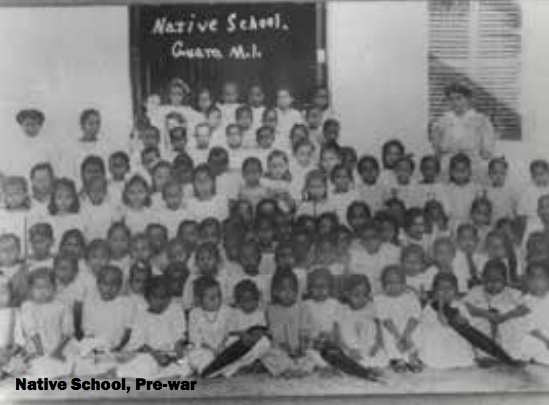 Public education in English was made mandatory, instruction emphasizing the magisterial nature of the colonizer and burying Chamoru history including the Chamoru language itself which was banned in this and all government-controlled settings. True to the insidious nature of coloniziation, with time it would ultimately be Chamoru teachers who would enforce this policy, exacting physical punishments on students for speaking their language. Source. The people of Guam were subject to the harassment and whims of whatever naval governor happened to be in charge. One was known for his public spectacle of humiliation, ordering a village to watch as he shaved the head of a woman for being “immoral.” Another had designs to force women who gave birth to “illegitimate children” into a “leper” colony in Tumon. Whistling was outlawed and able-bodied men were required to present the naval government with five dead rats each month. Laws and ordinances would be passed by the naval government covering everything from the composition of people’s yards to the length of girl’s dresses to the prohibition of aguåyente (coconut liquor). Source. In 1919, the men of the naval government set it sights on…and outlawed…. the ancient Chamoru practice of matrilineage whereby women maintained their family’s wealth, had final say in the governance of both their home and village and were the primary caretakers of their children and land, passing the latter down to women of the next generation. Chamoru women continue to have a legacy of leadership that historically has helped keep the culture and history of their people alive. Source. Source. Source. The Catholic Church, established long before the US colonization, played an essential role in the daily lives of the Chamoru and in the ways they maintained ties across the island. The Catholic priests, themselves Spanish and seen as community leaders with powerful influence, worked against the US attack on religion and language, providing sanctuaries for Chamoru cultural norms. The US response both early on and in the decades to come would be to deport these priests. Naval governors also supported the fledgling Protestant missions that were being established on Guam. Deportations would continue in bursts and in 1941 all Spanish priests on island save for the archbishop were removed by the US Navy and replaced with American Catholic priests. Source. In theory, the Navy ruled the entire island. In practice, due to limitations imposed by the limited naval resources and geography, this rule was concentrated into spheres of influence concentrated in the villages of Hagåtña and Sumay, which housed the majority of the American military presence, and centered on institutions such as education, health care, politics and economy and in all of these the US attempted to leverage its power to instill lessons of inferiority on the part of the Chamoru and to suppress Chamoru culture. They did not just dispense “democracy”, health care or education, but also colonial ideology as well. Each time Chamoru participated in these programs they were not just proselytized about America’s greatness but also instructed in Chamoru inferiority, dependence, or even non-existence as a people. Source. The Organic Act of Guam passed by the U.S. Congress in 1950 made Guam an unincorporated territory of the United States with limited self-governing authority. With a current population of approximately 173,456, Guam is one of 16 non self governing territories listed by the United Nations, and represented by one non-voting delegate in the U.S. Congress. Federal-territorial policies are decided in Washington, 7,938 miles away, placing a number of restrictions on the island and hampering the development of a viable civilian economy. 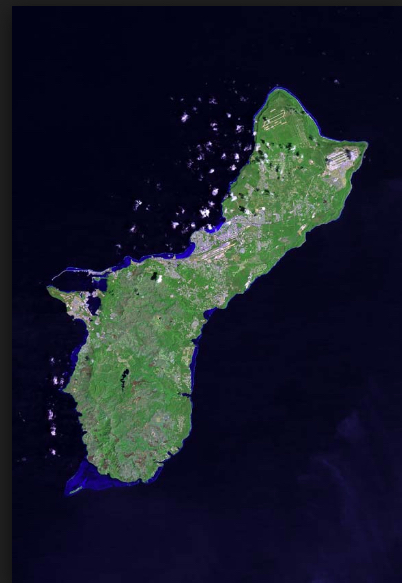 Prior to WWII, Guam was self-sufficient in agriculture, fishing, hunting, and husbandry. US Naval administrators encouraged food production for local and military needs. Nearly every family grew vegetables and produced meat; some specialized in fishing and there was a viable copra industry. Following World War II, the military took a large portion of arable land to build bases and other installations, equivalent to nearly 50 percent of the island’s landmass, including some of the most fertile lands near popular fishing grounds. Since then, some lands have been returned following the civic protest, with the U.S. presently occupying nearly one-third of the island, part of which is not presently being used. Unlike in the past, nearly 90 percent of Guam’s food is imported. Source. The island’s economy is geared toward the military. Poverty rates on Guam are high, with 25% of the population defined as poor. Between 38% and 41% of the island’s population qualifies for Food Stamps. Wage rates are low; schools are underfunded and there are few opportunities for technical training on the island. Source. The island’s infrastructure is poor. The only civilian hospital operates at 100% capacity three weeks out of the month and its school system struggles to meet payroll several times a year. The island’s water supply is barely adequate to sustain the current population and the only civilian landfill for trash disposal is nearly at full capacity. Government of Guam agencies that oversee education, mental health, substance abuse, and the landfill are currently under federal receivership, meaning that the federal government has hired an independent entity to take over certain functions of these agencies due to substandard conditions. Source. Today the people of Guåhan do not vote for the US president, they are not represented by a US senator and they elect a non-voting delegate to the US Congress. Source. Marginally employed or working for the military, Chamorus have increasingly felt like squatters on their own land. Source. Despite the aim of McKinley and Manifest Destiny, Guåhan and its fellow Mariana Islands remain a locus of Indigenous peoples, culture, history and traditional civilization. This is not just a U.S. military base, but a place with a long history and deep cultural roots, whose “American” people have striven for democracy for over a century, and still don’t have it. Source. The contemporary Guåhan hashtag of the growing Chamoru resistance #WeAreNotAmerican speaks to the hypocrisy of the area being sufficient for American military exploitation and its residents suitable for utilization as US military personnel while simultaneously preventing these same patriotic residents from earning full citizenship and democratic representation because they are not “American enough.” The people of this region serve in the US military at rates three times higher than any other state or territory, with at least one in eight currently serving or having served in the armed forces. They have high “loss of life” ratios and suffer “killed-in-action” rates up to five times the national average. In some villages, an entire generation has not returned from overseas deployments. Frank Blas, Jr., former Guam Senator. Source. The #NotOneMoreAcre hashtag addresses the militaries current policy and legacy of land takings from the local population. No payment and compensation is given. 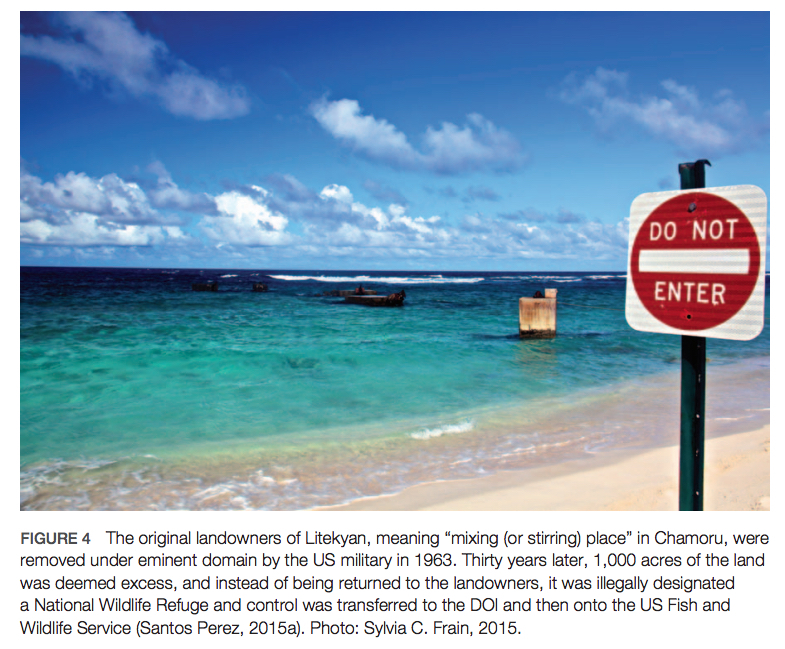 58% was annexed after World War II through eminent domain even though the Chamorus of Guåhan were not yet US citizens. Some of it was returned. Current generations are very aware of the amount of land their family sacrificed. Source. The Chamorro Land Trust Act authorized the Chamorro Land Trust Commission to lease 1-acre tracts of land for residential use, or 20-acre tracts for agricultural use, to “native Chamorros” for $1 per year for a 99-year term. 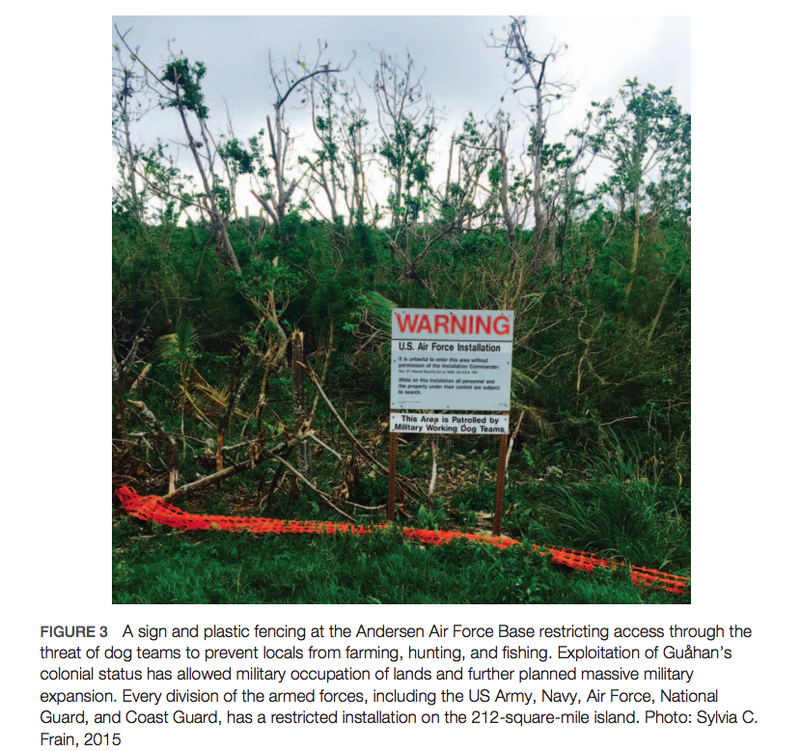 The CLTC controls about 33 percent of Guam’s governmental lands, or approximately 11,622 acres, the lawsuit states. In fiscal year 2017, the CLTC granted 274 residential and agricultural leases. The US has vast plans for expansion in Guam, described as the “largest project that the Department of Defense has ever attempted” which would include the acquisition of 2,200 additional acres of private and public land, which would bring its land holdings to 40 percent of the island. Means of the acquisition remain unclear. Thousands of additional personnel and various other expansions including a live fire range next to the wildlife refuge are to be expected. The hypocrisy of the colonial militarized relationship lies in the fact that the United States uses these locations, which are “denied basic rights of freedom and self-determination,” in the name of protecting freedom and democracy. Source. Above: The Chamoru Pledge was developed as an alternative to the Pledge of Allegiance to the United States, which is seen by some as imperialistic propaganda imposed on the people of the Mariana Islands. The Inifresi uses the robust language of sacrifice, such as “with all my might,” similar to US military slogans. However, it paradoxically calls for protection and defense against American militarization and destruction. Residents of Guam continue to organize and use the limited means available to them to stem the expansion of US military and the counter-Chamoru narratives that continue to flourish. Creative forms of resistance by artists, poets, scholars, student activists, and many others “are contributing to a transoceanic consciousness rooted in social and political justice”. The newest generation of protectors and defenders, as inspired by the Inifresi, are combining their reconnection with culture with community building through online outlets. They are creating solidarity through the web-based arena, including blogs, websites, online zines, and plays (Na’puti, 2014, n. 9). Many are using social media sites such as Facebook and Instagram and the visual platforms of YouTube and Change.org to organize and mobilize. Prutehi Litekyan is a direct action group dedicated to the protection of natural and cultural resources and is actively working to oppose the expansion which only further degrades the island, people and culture. Source. Since the start of occupation, preservation of the language in the face of its intended extermination has embodied this resistance. 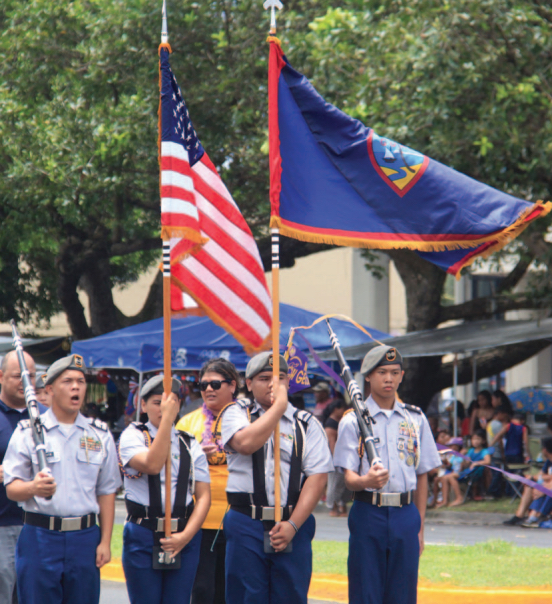 Guam has taken steps to increases the teaching of the Chamoru language and culture in Guam schools. Other creative ways to incorporate and promote the Chamoru language have been found in the use of applications for smartphones, internet videos and television. From Chamoru dictionaries to the most recent “Speak Chamorro” App to a free language instruction website efforts are growing and expanding in ways to preserve and protect the Chamoru language and identity. On YouTube, a popular Chamoru soap opera Siha has received mostly positive feedback from native Chamoru speakers on its ability to weave dramatics, the Chamoru language, and island culture into an entertaining program. On TV, Nihi! Kids is a first-of-its-kind show because it is targeted “for Guam’s nenis that aims to perpetuate Chamoru language and culture while encouraging environmental stewardship, healthy choices, and character development.” Source.